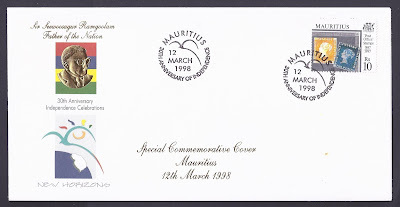 The Mauritius Postal Services issued a Special Commemorative Cover on 12 March 1998 to mark 30 years of independence of Mauritius. The paille-en-queue (a.k.a. phaéton) featured on the cover and in the special cachet. Two indigenous species in Mauritius: the White-tailed Tropic Bird and the Red-tailed one. 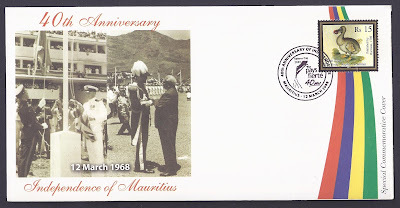 Mauritius gained independence on 12 March 1968 from the United Kingdom with Queen Elizabeth II as Monarch; Mauritius was previously also a Dutch (1638-1710) and a French colony (1715-1810). 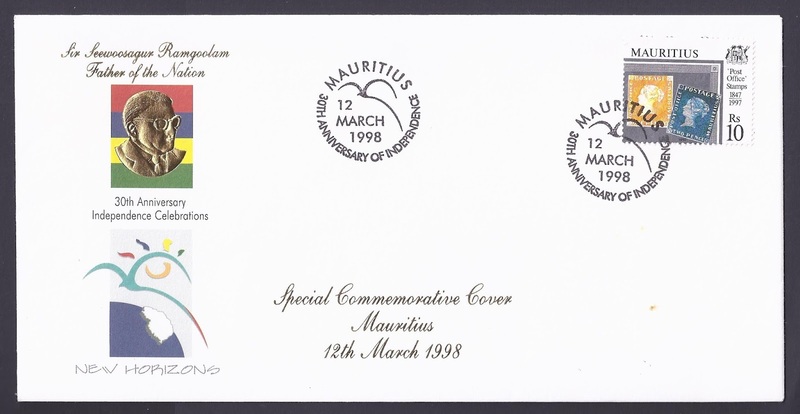 On 12 March 1992, Mauritius attained the status of Republic within the Commonwealth with the President of Mauritius as Head of State. Some remnants of the British period are our judiciary, the First-Past-The-Post electoral system and our driving on the left. 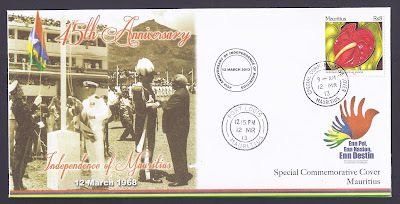 The Mauritius Post issued Special Commemorative Covers on 12 March 2008 and in 2013 to celebrate the 40th and 45th anniversaries of independence respectively. "Nou pays, nou fierté." Our country, our pride. Note the difference in spelling of the Mauritian Creole word for 'country': "pays" like in French in 2008 and "pei" in 2013, and the use of accents in 2008 (for "fierté") and not in 2013 (for "pei"). "Enn Pei, Enn Nasion, Enn Destin." One Country, One Nation, One Destiny. Both SCCs portray on the left the lowering of the Union Jack and the hoisting of the new Mauritian flag at the Champs de Mars racetrack where thousands gathered. On the right, Sir John Shaw Rennie, the last Governor, i.e. the acting Head of State, of colonial Mauritius congratulates Sir Seewoosagur Ramgoolam, the first Prime Minister of independent Mauritius. After independence, the former became Governor-General of Mauritius. The recurrence of Sir Seewoosagur Ramgoolam, dubbed by some 'The Father of the Nation,' on these SCCs and in the corresponding inserts, unfortunately does not reflect the work and efforts of other founding figures of independent Mauritius. Private philatelic cover serviced at the Philatelic Bureau, Port Louis on 12 March 2013. 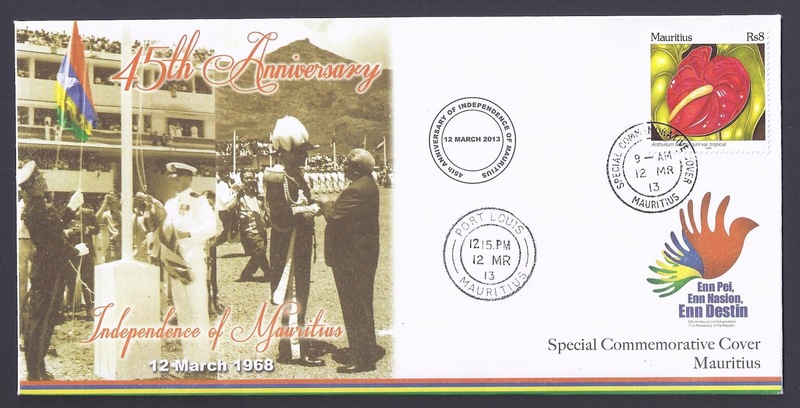 12th of March being a public holiday in Mauritius, all outlets of the Mauritius Post are closed, with the only exceptions of the Postal Museum in Port Louis and the Philatelic Bureau, located in the Museum, opened to tourists and philatelists who wish to have their covers or mail serviced with datestamps indicating 12 March, independence day. Commemorative stamps were released for the 5th, 20th and 25th anniversaries of independence, and definitive stamps (the 'History of Mauritius' set) for the 10th anniversary. P.S. : The Postal Museum and, by extension, the Philatelic Bureau are open on public holidays; unless the public holiday is on a Sunday in which case the Postal Museum is closed. 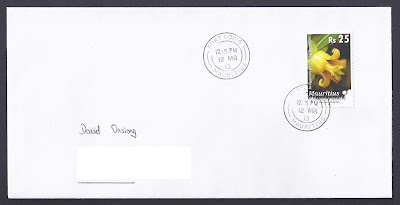 The last time the Postal Museum was exceptionally open on a Sunday was on 9 October 2011, World Post Day, when two stamps were being released. Selected Post Offices throughout the island also opened for business for limited hours on that day. From the '150th Anniversary of the 'POST OFFICE' Stamps' issue of 22 September 1997. From the 'Dodo (Raphus cucullatus)' issue of 25 June 2007.